The Central Valley, due to its agricultural capacity, is a breadbasket for the United States. This comes with rewarding benefits and inevitable costs. The inevitable costs that the Central Valley faces include maintaining access to ample water supplies for agriculture and keeping groundwater clean. It is a challenge that offers many opportunities for researchers to crack the code to overcome these obstacles. Through his research, Kaomine Vang, is one of many who people who are seeking to add value to the field of water research, specifically addressing water preservation and cleanliness. 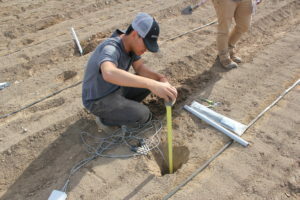 Vang, in a recent project, sought to discover an effective way to improve irrigation water use by employing a distributed sensor network (DSN) of site instrumentation coupled with physical sampling (PS). The purpose of using the DSN, coupled with the PS, will allow the capability of measuring nitrate leaching below the root zone, plant nutrient uptake, and nitrogen lost to the atmosphere, such as ammonia volatilization. The core objective of employing these environmental sensors and climatic data inputs is to apply water that is based on evapotranspiration (ET) to improve how water is used by the irrigation system to meet the needs of the plant. Once the fluxes of water and nitrogen are measured and quantified, the system can then deliver the ideal amount of fertilizer, in order to minimize nitrate leaching in an a t tempt to preserve groundwater quality. 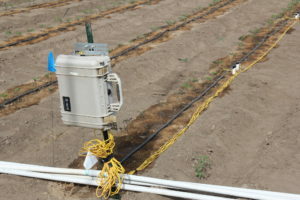 The project took place on Center for Irrigation Technology’s research plots at Fresno State and used drip irrigation, which allows good precision and uniformity. Four students assisted with project research helping to design, implement, collect data, and manage the project. They made presentations at conferences. One of the most interesting aspects of the project is that the researcher, along with the students, bought off-the-shelf equipment and built a nitrogen analyzing system. Vang is hoping to expand on the technology they are creating and the research is to continue until June of 2018.